One of the most-visited cities in the world, the Italian capital rightly attracts millions of visitors from all over the globe each year. Its architecture, style, history, cathedrals, piazzas, landscapes – not to mention the food - means that Rome has something to offer every tourist. A truly romantic city, no one could fail to be moved by its beauty and vibrant atmosphere. Accommodation options are in abundance too, from cheap and cheerful centrally located hostels for budget travellers and backpackers, to some of the most luxurious five-star havens on the planet. 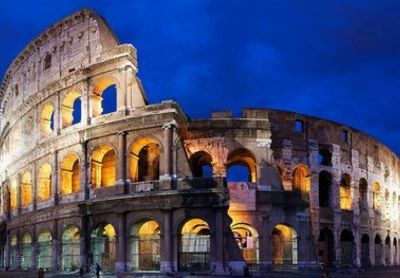 You’ll find plenty of car rental options at the airport, as well as within the city itself and this is a great way to explore all of Rome’s exciting sites and surroundings. Make a beeline for Rome’s historic centre, the whole of which has been designated a Unesco World heritage site. You’ll find a dizzying array of historic basilicas, cathedrals, beautiful palaces, ancient ruins, statues, sculptures, and fountains to explore. Soak up the cosmpolitan atmosphere and sip an espresso at the famous Piazza Navona, and for nightlife start your journey at the Spanish Steps Church. As well as its famously iconic sights, Rome also serves up plenty of essential experiences, like sampling the fantastic cuisine, exquisite wines and spending an afternoon (or two) visiting the city’s incredible fashion stores. All roads may lead to Rome, but once you get there you might start to wish they all led out of there. Rome isn’t the easiest city to drive in, with so many ancient narrow streets winding their way around seemingly endlessly, and some pretty colourful language from local drivers along the way. Non-locals aren’t allowed to drive in the historical city centre (which is probably for the best!) so remember to park outwith this area to avoid a penalty. Umbria, Lazio, Tuscany and Naples are all within easy reach by hire car if you’re looking for a bit of escape from the hustle and bustle of the city too.